The Science of Equestrian Sports is a comprehensive study of the theory and practice of the equestrian rider in sport. While most scholarship to date has focused on the horse in competition, this is the first book to collate current data relating specifically to riders. It provides valuable insight into improving sporting performance and maintaining the safety of both the horse and the rider. This book is a holistic and scientific examination of the role of the rider in equine sports. It is essential reading for sport science students with an interest in equestrian sport and equitation. Furthermore, it will be an invaluable resource for instructors, coaches, sport psychologists, or physiologists working with equestrian athletes. Introduction Chapter 1: Motor Control of the Rider: On moving and being moved Chapter 2: Performance Physiology and Rider Fitness: Riders are athletes too! Chapter 3: Sport Psychology in Equestrian Sport: merely mind games? Chapter 4: Coaching Riders: From a different perspective Chapter 5: Injuries in Equestrian Sport: Dealing with it or part of the deal? Chapter 6: Horse-Human Interactions: Art or science? In Conclusion: Quo Vadis, Equestrian Science? 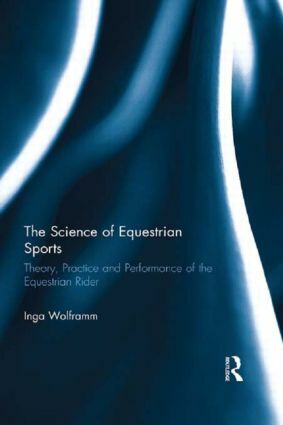 Inga Wolframm is a Senior Lecturer at the University of Applied Sciences Van Hall Larenstein, the Netherlands, an accredited sport psychologist and a Council member of the International Society for Equitation Science (ISES). Her research interests focus on psychological, physiological and social processes in the rider, including horse-rider interactions.